Most of the people who know me would be aware that I am every bit a coffee girl. I love coffee, mostly when there is no cream on it and just a little bit of sugar. Not having one cup daily is a challenge for me because it feels like the one thing that gives me energy and wakes me up in the morning so that I can start my day right. Someone once asked me if I would ever switch to tea in the morning instead of coffee. I said no. For me, tea is equated to times when I don’t feel well and my father would make me drink it to help me feel better. I also tend to think of those diet/laxative types of drinks when I think of tea. It’s a weird thought to have but it’s what made me avoid tea for some time. I always thought of tea as just one flavor: the lemon-ish Lipton kind. I wasn’t aware of the other variants/flavors until I had a panic attack and someone brought me some Chamomile Tea. Since that first taste of flavored tea I’ve had the urge to search for other types to try. This led me to discover the Twinings Tea Collection. I found several variants at a supermarket and decided to try all the available flavors. Out of all the variants that I found on the Twinings website, there were only a few available. I hope that one of these days I could find some of the other flavors from the Twinings selection so that I can try them as well. First one I tried was the Twinings English Breakfast Black Tea. 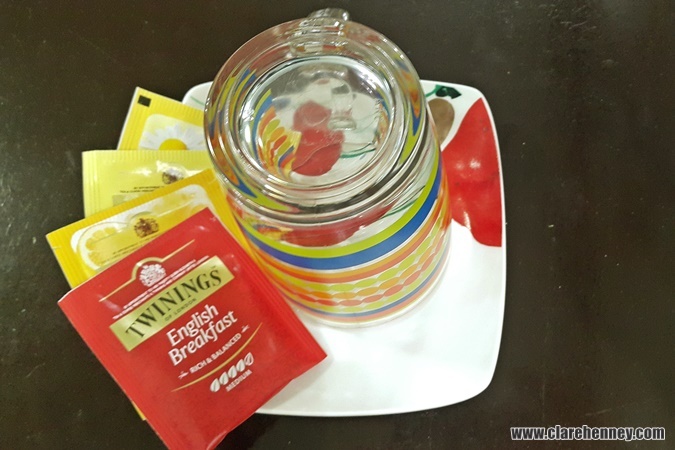 It has a strong flavor and while it’s not exactly coffee, it’s something that I prefer to use as an alternative when I need a bit of a strong brew to start my day. My mother and sisters don’t like it as much but then they aren’t coffee drinkers (or should I say addicts) like me so that could be the deciding factor on why one would like this variant or not. 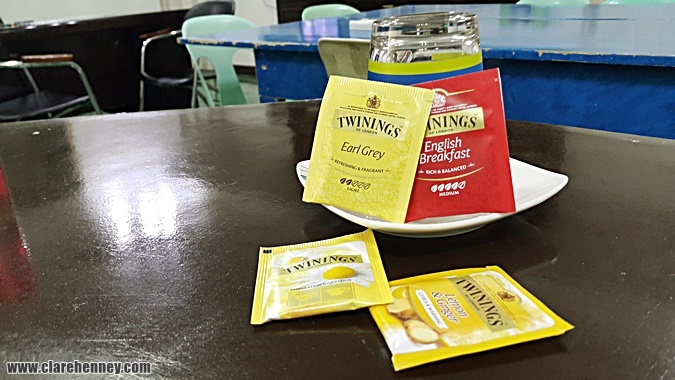 The Twinings Earl Grey Black Tea is the second one that I’ve tried. It’s like the English Breakfast tea, although it is a bit lighter in flavor and seems to have a lemon-ish hint to it. It’s good, but I still prefer English Breakfast to this one. Another strong-flavored tea is the Lemon and Ginger variant. It’s strong in the sense that if you haven’t tried ginger tea in your life, you’d probably want to steer clear of this or just dip the tea bag for a minute then take it out of your cup. The ginger flavor can be a bit overpowering for you if you don’t like it as much. The lemon flavor is there but it’s mostly ginger in my opinion. It’s a good thing to drink when you have a cold though – it’s helped me when I feel like I’m losing my voice or I have a bad cough and cold. One other variant that I’ve tried that my family doesn’t seem to like is the Chamomile Tea. I love it because it reminds me of the time when I first discovered flavored tea and it really does have a calming and soothing effect when you take it. I think people get a bit put off when they get a whiff of the floral scent and makes them think of perfume when they try it so they say they don’t like it…maybe it’s more of a psychological, associative thing than a reaction to the flavor. There are still several flavors I haven’t tried from the Twinings Selection. The ones I’d like to try the most would have to be the China Rose, Darjeerling and White Tea. One thing I haven’t tried with my tea though is mixing it with milk/cream. It’s the same thing with me and coffee – I feel that it’s already a different drink altogether if you mix it with cream. It loses the flavor that I enjoy from it. I’ll never say never about trying it but for the time being, since I’m still enjoying experimenting with the different flavors, I’ll enjoy tea plain. I’ll take the experience one step at a time. Cream can come much, much later.